Bibimbap is one of the simplest meals to prepare since it doesn’t have any definite ingredients. Bibimbap literally means “mixed rice” which is a fitting description as it is basically rice mixed with a bunch of vegetables, and usually an egg on top. Some variations of the meal also include ground beef, but you can pretty much just slap together all of your left-over side dishes and bam, you have bibimbap! My favorite variation of the dish is by far ‘dolsot / 돌솥’ bibimbap, which is served on a stone pot (the ‘dolsot’). The pot not only heats up the usually cold bibimbap, but it also makes the rice a bit crispy for an extra crunchy texture. 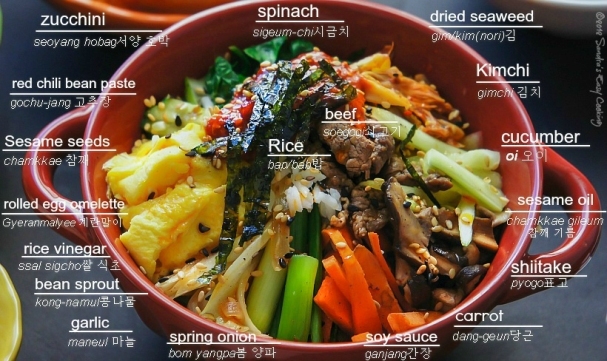 You can find bibimbap at many restaurants in Korea and abroad as it is one of the most common signature dishes. Korean food is amazing in that there are so many options, you can always discover something new if you just go a little out of your way and out of your comfort zone. A dish I only recently became aware of is Seolleongtang. This soup, like most, is greatest on cold days as its rich flavors combine with the warmth of the soup to give you complete satisfaction. 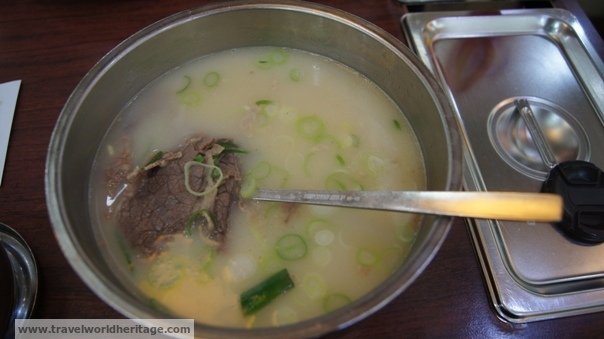 It is a white colored soup with very fine brisket beef slices. The soup is usually served with an insane amount of green onions, a personal favorite of mine. The broth itself is made from ox bones and takes up to a full day to prepare. This slow cooking process is what gives it its flavor and milky white color. Sundubu jjigae, I must admit, was not something I even wanted to try at first. Tofu doesn’t really have much of a flavor itself, so if the soup is sub par, it’s the blandest thing in the world. Sidney insisted though, so I gave in and gave it a whirl. I’m glad I did! This soup is very rich with so many flavors that just makes your mouth water. The soup is supposed to be spicy, but can also be salty depending on where you buy it. It comes in a porcelain bowl which keeps the soup boiling hot for a long time. 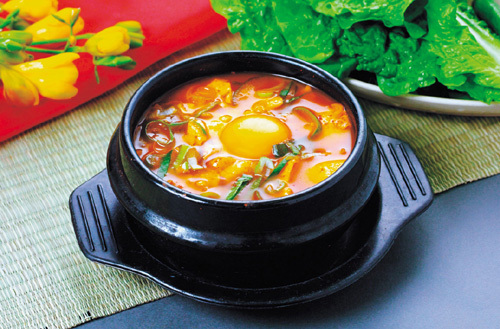 Right before you are served, a raw egg is dropped into the soup which the bubbling broth quickly cooks. One disappointing aspect of the soup is that no matter where you buy it, it seems to come in a smaller bowl than any other Korean soup. I am a kind of a big dude and the small portion doesn’t fill me if I am starving, so it is perfect for those ‘kind of hungry’ days. Like LA galbi, sundubu jjigae was also created by Koreans in the Los Angeles area, so it is not technically ‘from Korea,’ but hey, it still counts! 2) Tteok Galbi / 떡갈비 / Grounded Pork or Beef?! Tteok means “rice cake” and is one of the more common, and quite frankly, blandest foods found in the Korean peninsula. You can find it as an uninvited side dish with your great Samgyeopsal barbeque, taking space in your awesome yangnyeom chicken bowl, or as a poor excuse of a ‘treat’ given on special occasions like Chuseok. Eating ttok is like chewing on an eraser, which is why I never bothered to try ttok galbi until this last weekend. So, apparently, it is only called ‘tteok’ galbi because the method of mashing the meat that makes up this amazing dish resembles the method of making rice cakes! Oops! Tteok galbi originates from Damyang county, which I had the pleasure of visiting for the first time over the Chuseok holiday weekend. Sidney tends to make a point of making of our trips as gastronomic as possible, so she went out of her way to calm my fears of tteok galbi having any tteok. I was pleasantly surprised! The reason for the question marks in my description is because of the nature of traditional Korean food. In the west, we are used to having an individual meal which is yours and yours alone. However, Korea of a very communal society and this extends into the kitchen as well. While meals like Seolleongtang and kimchi bbeogeumbap are traditional, buying them doesn’t really reflect a typical, traditional Korean meal which comes with side dishes called Banchan / 반찬. As a traditional Korean dish, tteok galbi comes with a ton of banchan with the big chucks of meat placed as the centerpiece. Although Wikipedia says otherwise, this meal comes in either beef or pork, but doesn’t have to come as a mixture of both. The meat is similar to ground beef which allows it to be shaped into the typical square shape of tteok galbi. While it is one of the pricier Korean meals, it is definitely worth it if you want to experience a true Korean style feast. I am surprised I haven’t mentioned this sooner as it is one of two Korean meals that I can make and not be ashamed to share with others. What can I say, while I am not exactly a master chef, my hand has been known to slip from time to time and accidentally make something edible! This wonderful spicy soup is, as you guessed, made of kimchi boiled over its own juices for a delightful taste. (Well, maybe you didn’t guess those EXACT words.) The versions I have tasted are plain, tuna, and pork, the last one being my favorite! 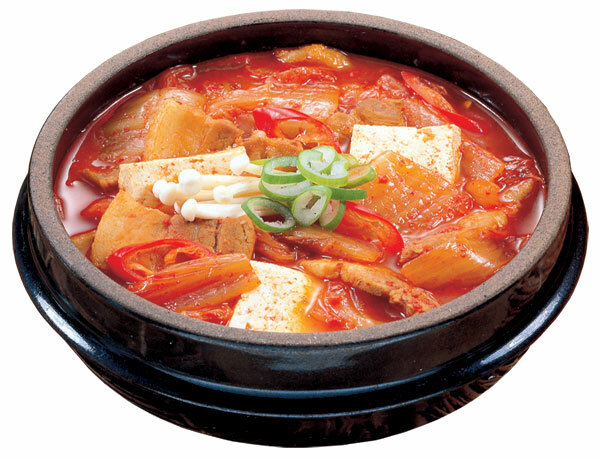 If you like kimchi, then you’ll love its hot soup cousin kimchi jjigae as it is basically the same thing, but for a cold winter day. There are restaurants all over South Korea that serve nothing but the different variations of kimchi jjigae, so try them all and see which one fits you! If you have tried all 5 of these meals, pat yourself on the back, you are on your way to becoming a true Korean food connoisseur.